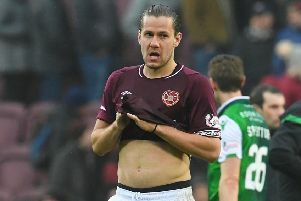 Hearts fans attending their side’s William Hill Scottish Cup quarter-final match with Partick Thistle at the Energy Check Stadium at Firhill unfurled a banner hitting out at the day and time of the fixture. The fourth of the last eight matches kicked off at 7.05pm on Monday night, with BBC Scotland screening the match live. Hibs’ tie with Celtic was scheduled for 5.15pm on Saturday night, while Aberdeen’s clash with Rangers and Dundee United v Inverness Caledonian Thistle kicked off on Sunday at 1.30pm and 3.30pm respectively. Supporters had criticised the timing of the match with some questioning why the game couldn’t have been played at lunchtime on Saturday, while others pointed out they would be struggling to make the start due to work commitments. Ahead of the match, a group of Hearts fans in the Colin Weir Stand held up a banner reading “Weekdays are for replays”.